Now that you are all geared up for fishing with your line, reel, rod and lures, the next best thing that you need is a fishing cooler. That’s only if you plan on keeping the fish, your fishing cooler will keep your fish cold and fresh. Not only that, if you carry drinks and food with you, it will also keep that clean. No matter how hot the weather may get, your fish and your glasses are going to stay chilled. You can go for a portable ice chest, a traditional ice chest or even an insulated fishing bag, it’s all up to you. There’s nothing wrong about any of these coolers, it’s just that you need to know which one suits your needs. We have reviewed ten of the best fishing coolers out there. They are all tested and proven to fit your needs. Now it’s your turn to pick the one that you like the most and more importantly, the one that fits your budget too. We are always on the run for budget-friendly kinds of stuff; whether it’s for fishing or other adventures. The Igloo Super Tough STX Sportsman Cooler is a good choice of fishing cooler. However, in spite of fitting your budget, this Igloo fishing cooler is known as the “toughest” in its value. Let us start with the fact that it has a killer cooing ability. It can last ice for around 6 days straight until and unless it’s exposed to optimal conditions. Thanks to the extra thick shell and the nice-sealing lid that provides such facility. The Igloo Super Tough STX Sportsman Cooler is able to handle the most intense abuse, whether it’s on water or on land. To be fair, rubber grips are extremely helpful when transporting the cooler. Although the weight of this cooler is 30% more than other models, it makes it comparatively sturdier. Although the fasteners that hold the lid are well-built, you still need to ensure that they are closed secured; otherwise, air may escape from the gap, resulting in the ice to melt faster. There are no complaints regarding its visual appeal. The alternating light-brown color is quite aesthetically pleasing. Including the handles and the built-in cup holders are not in any way gimmicky. Overall, the gasket backup plates along with the stainless-steel built to give a very high-quality product vibe. But there’s one that we don’t quite appreciate this product. First off, the cooler is very heavy. You cannot easily transport it around whenever you want. This is a typical thing for traditional coolers. Lastly, despite all its flaws, this is well-performing, quality cooler at a decent price that we would highly recommend to any of our fellow readers. 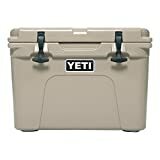 The Yeti Tundra 35 Cooler is perhaps one of the smallest coolers in the Yeti series. This well-known brand is all about quality and high performance. When it comes to ice retention, the Yeti Tundra 35 Cooler is perhaps one of the best. It comes with extra thick walls that are able to hold up to 2-inches of insulation. Moreover, PermaFrost insulation is injected with the pressure that makes sure that the temperature inside is not affected by the temperature outside. The cooler has leading ice retaining technology, which can keep your ice stay for at least 3 days. It is, in fact, great for little camping. The cold gasket lock and the inner light lid system makes this possible. However, Yeti suggests that it’s better to pre-cool your items before putting them into the cooler and cover it with dry ice. By doing so, you will be able to get the most extended use of the ice. Speaking of its design and construction, the roto-molded polyethylene construction provides reliable durability with excellent impact resistance. It also comes with the PermaFrost insulation that injects the pressure. The cooler itself is very rugged. It comes in 6 different vivid colors that you could choose from. What we like the most about this fishing cooler is that it is unquestionably strong. For instance, you could use it as a seat if you’re worrying too much about bringing a chair with you to fishing. It’s very versatile that can be carried in a few different ways. When it comes to its downsides, the Yeti Tundra 35 Cooler is actually much more expensive than the other fishing coolers. In fact, it’s pricier than its size. However, since Yeti is a premium brand, it does still make sense because you are getting way more value. If you don’t like fancy accessories, then the Igloo Marine Ultra Cooler might be an ideal pick for you. 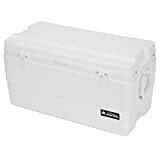 As the name suggests, this all-white Igloo Marine Ultra Cooler is specifically designed to be taken on a boat to the rivers, lakes or even ocean or you may also keep it at home. It has some unique features that might be suitable for different marine environments. As you must have noticed that it’s pretty dull in its appearance, it’s the complete opposite in its features. One thing that this cooler has is the UV protected hard outer shell that protects it from fading. And you won’t have to bother about cleaning it because it’s pretty easy to do so. The manufacturer says that their product is made out of stainless-steel hardware. This makes the cooler rust-resistant and durable in the long run. When it comes to the ice insulation, the cooler is equipped with Ultratherm Insulation that extends the life of the ice up to 7 days. That’s amazing! On top of that, it comes with a Cooler Riser Technology, the specialty of which is that it elevates the base of it off the ground. This reduces the cooler’s direct contact with the warm ground. It’s worth mentioning that the cooler comes with wheels. What these wheels do is make it easier to transport it around. And of course, the extendable handles make it much comfortable. You can always minimize the handles when they are not in use. The thing that we like the most about the Igloo Marine Ultra Cooler is that you can carry with you in your canoe. This makes it more convenient to use as you pay lesser for its price. The Pelican Progear Elite Cooler is not as fancy as the others that we have reviewed, but it sure is one hell of a cooler. 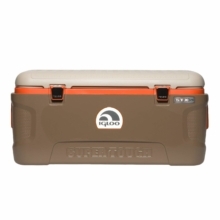 Okay, one word that defines this cooler is that it’s bear-resistant. The Pelican Progear Elite Cooler is convenient, heavy-duty, multipurpose and customizable. What else do you need? And on top of that, this cooler is able to retain ice for up to ten days! If nothing else impresses you, then this quality sure will. Unlike other cheaper coolers, this heavy-duty cooler is certified by the Interagency Grizzly Bear Committee (IGBC) to be bear resistant. So, even if you come across wild animals during camping or fishing, they can’t steal the food you keep in the cooler. The Pelican Progear Elite Cooler isn’t just called elite without any reason; it has 2-inches of thick polyurethane insulation along with latches and airtight, a lid that keeps the freezer secured from all evil. You will be surprised at how sturdy it is. The product is 100% corrosion resistant as it’s made of stainless steel. It also has the molded-in lock clasp with a plate that’s also made of stainless steel, which takes security to a whole new level. And needless to say, the large and robust wheels are designed to make it through any type of terrain without being stuck. In terms of usability, you can make it everyday fun stuff to use it. It has a built-in bottle opener at one of the sides. Interestingly, it has a fish scale on its lid that helps you measure the fish you have just caught or other measurements you may need. And besides, it has some really cool facilities like beer holders and drains plug. Other than that, it’s committed for life. Igloo Marine Cooler is a pricier version of the Igloo Marine Ultra Cooler that we had examined just a while back. Although it’s pricier, it’s still better than that in many other ways. First of all, this fishing cooler comes with double the size of many other coolers. It has 150 quarts of room. In fact, you will find that many expensive coolers lack this much of space inside. It’s ideal for storing large fish fishes straight out of the sea along with your drinks and other food supplies that may come with. Thanks to the Cool Riser Technology that promotes airflow underneath for improved cooling performance. It has an elevated design that prevents the cooler from touching the ground, which may cause the ice to melt faster. It allows air to flow underneath. No matter how hot the sun may get, the UV resistant body and odor resistant interior of the cooler protects it all. In tune with that, this makes the body sweatproof, waterproof and excellent ice retention. The cooler is able to hold ice for 5 days at a temperature of 90° Fahrenheit, which is quite a big thing for a big cooler like this. All credit goes to the Ultratherm insulation. Now coming to the best part, this cooler can last you a good ten years without any interruption in its service. It works for days while you take it for fishing and you won’t face any issues. This is all pretty good. And if you are still in confusion, know that the manufacturers, Igloo, are one of the industry rulers who started the whole fish more cooling concept. You can never go wrong with one of their models. This is yet another one of those jack-of-all-trades quality fishing coolers. This trimmer is an excellent value for its price but is more versatile when you actually use it for your needs. 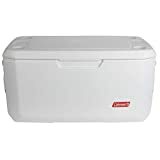 The Rubbermaid Gott Marine Cooler is a 102-quart cooler with high structural stability and conventional robust handles for better transportation. This brings us back to talking that you can carry about 170 lbs. of fish with another 30 pounds of ice effortlessly. The cooler is 100% stain and odor resistant, but with better clean up, you can maintain it to be much better. Its plastic is also BPA free, and FDA approved. This makes it a safer option for you to store your food items. The insulation of this fishing cooler is something; it’s exceptionally thick and can retain ice for up to 7.5 days like clockwork. The cooler even comes with 2 Iceolater bottles that make it easier to take water with you while fishing. Every handle that comes with the cooler is sturdy enough for you to pull it to your boat or vehicle. Although it doesn’t have wheels, the handles make it so much easier to transport it around. Moreover, it also comes with built-in cup holders. The Rubbermaid Gott Marine Cooler is pretty good as it can easily in 12-pound cans and 20-pound bottles. Ideally, you can throw your catch as well as your drinks into the cooler, shouldn’t be a problem at all. Last but not least, buying this fish cooler has some serious benefits: you get buyer’s protection, which means you get a full refund if you aren’t satisfied with it. The lid comes with a fish scale and a threaded drain plus, which can also sit at least 2 adults effortlessly. Among all the pretty coolers that we have listed, the most obvious difference with this one is that it comes with a shoulder strap bag that has a zip topping opening. And this is also one of the first coolers, just have a look at it! As suggested by its name, it has a high-density of insulation that keeps things colder for extended hours. It is guaranteed that the leakproof liners will keep things cold for 24 hours at a 120° temperature with about 48 cans on board. The main reason why we would call this special is because of its shoulder straps. They are excellent and sturdy. Of course, they make carrying it easier for you in many cases. The cooler weighs about 4 pounds, which is not big of a load for you to move. The straps are totally adjustable and made of durable soft canvas materials. It stands up to travel but surely will not scratch the boat interiors. That being so, it’s very easy to carry it use and carry it around, especially for fishing. The strap bag also comes with an exterior pocket for you to store little stuff like a bottle opener. There’s no question on the durability of the fish cooler. The exterior canvas is pretty sturdy and is going to last you long enough. The straps are not just anything that would break about easily either. So, with this by your side, you are on a mission of triumph. If you aren’t looking for anything too special, the AO 24 is a pretty good option. You get what you see and what you pay for. However, one drawback about this product is that even if it gets slightly inverted or on its side, there’s a tendency of leakage. So, beware! First off, this cooler has noticeably thicker insulated walls and insulated lid. The walls and lid are about 1.5-inches thick that hugely extends the life of the ice up to 6 days. On top of that, there’s a leak-resistant drain that aids in removing ice melted water. One thing that we really appreciate about the Coleman Coastal Xtreme Series Marine Portable Cooler is that it’s incredibly robust. The sturdy lid allows you to put about 250 pounds on top of the lid, which not only makes it a good seating tool but also a temporary step tool too. It’s worth noting that the model comes with embedded cup holders to conveniently keep drinks and avoid unwanted spills. Moreover, the side handles are what you’d be thankful for. They make it a cinch to lift up the cooler from your car. The small handles are comfortable that does its job perfectly of controlling the relatively big cooler. The high-quality metal hardware makes it feel more like a premium product. The exterior looks very simple, yet it’s surprisingly attractive. And of course, it’s UV resistant that protects it from harmful sun rays, and the stainless-steel combats rust. However, keep it in mind that the stainless-steel hinges are directly screwed into the plastic and don’t come with a strap to hold the lid open. Other than that, it’s good enough to meet other people’s needs effortlessly. 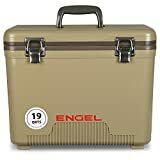 Engel’s products have always been unique, and this one is no exception. Available in 4 different colors, this product is made out of rubber, stainless steel and plastic. The gasket is 100% airtight and with a sturdy and robust body. The insulation ability of the cooler focuses on retaining both cold and hot items while being totally waterproof. In that case, the ice life may not be as high as the others. However, this is perhaps the first cooler in our list that has both the abilities. You can submerge the cooler into a depth of 3 feet of water, and it would still be as good as new and functioning just correctly. Even the issue of rust is not a problem. The quality is built to hold up most abuse that you throw at it. It’s a small cooler that has no side handles. A simple handle on the lid does the job. In addition to that, there are shoulder straps that can turn it to a sort of tote in no minute. The 19-quart cooler is not massive at all so you can carry it without any issue. Speaking of the visuals, this cooler is relatively attractive. It has changed the traditional look of coolers and adds to what looks like a quality product. Moreover, it’s well constructed as well as good looking, and that’s what matters. Overall, this is a smart and cool-looking fish cooler. The build is quite fantastic with impressive features that just win your heart. We weren’t lying when we said that we have an array of different types of fish coolers in our list. This one has something else to boast. You might have instantly noticed that this fish cooler is a backpack cooler, which of course has numerous benefits. Firstly, the IceMule Pro Insulated Backpack Cooler Bag has changed the game in the fish cooler industry. With this innovative design, carrying it has become so much easier, and of course, it’s an ideal tool for solo fishers. Thanks to the backpack carrying design that makes transportation so much easier. Moving on to its features, the IceMule has come up with a technology called the IM AirValue that allows you to introduce air into the walls of the cooler. It is designed in such a way that you won’t have to worry about cold air escaping the bag. The zippers come with a shut tight design and wrap up firmly. If you’re worried about how long the backpack can retain ice, then fret not! It has PolarLayer Insulation technology along with welded seams that make IceMule absolutely waterproof. Besides, it can keep content ice cold for more than 24 hours! 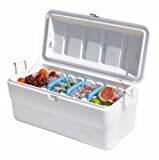 This is not just an excellent cooler for fishing, but also for day trips, hiking, and picnics. Obviously, the mobility and durability of the cooler is something to be very impressed about. While the durable and protective shield handles all sorts of bumps, scratches and typical falls, the keep it simple design makes it even easier to carry it around. Before we forget, let us talk about the MuleSkinET and the MuleSkinEV. MuleSkinET is basically the sturdy exterior, and MuleSkinEV is the rough and tough interior. Combinedly, these two create a rugged shell that protects against all evil and provides superior ice retention. Here is a handful of information that will help you select the best quality fishing cooler that you could take with you during fishing and other trips. There are two fundamental metrics to consider in relation to the size; the storage size and the overall dimensions. The storage size is merely about how much you can store inside it. Bear it in mind that just because a cooler advertised about having 50 quarts, it doesn’t mean that the 50 quarts of items that you store will remain cold. There are some coolers that have separate compartments for chilled and non-chilled items. One more consideration is that you need to check what are some of the things you’d be carrying with you. If you’re moving sandwiches, each of which would take up 4 quarts of volume, it might not fit in a 6-quart cooler if it’s too short. So, make sure that the ice chest able to meet in the stuff you are about to put in. Next, you have to think about the cooler’s size; how much space the cooler might take up. Some coolers are large, which makes it very laborious to carry it around while fishing. If it’s too big, then it might become a concern for you to fit it in your boat, car, and tent. The lesser space you have, the more compact of a cooler you have to think about. Coolers with thicker walls and thicker insulation that are made of hard plastic are usually a bit heavier and more prominent in size. These are the coolers that also durable and sturdy. However, you should go with something that you are more comfortable with. This is undoubtedly the most important part of the cooler. More importantly, if you are looking for solely to store fresh fish out of the water, insulation is all you need. Most coolers are also able to store beers and other food at an average temperature of 40°C. It’s practically not possible to test the temperature inside of the cooler for which you need to rely on how much of the time the ice can remain solid with the lid shut down. The amount of insulation that comes with the cooler varies across brands and if you are ready to pay for it, find yourself some coolers that can retain ice for a good 10 days. It’s especially needed for extended fishing trips. If you’re really looking forward to using it for different purposes like sitting, use it as a step stool as well as a cooler, we’d recommend you to go for a heavy-duty plastic one. That’s the one which is capable of withstanding any forceful impacts. Make sure that the hinges, latches, and handles are all made of strong materials. If you think that any of these features in the cooler has been compromised, the cooler will not last very long. An excellent way to check whether the cooler has a sturdy construct is by pushing the walls of it inwards. This is how you will be able to understand how strong the cooler actually is. In particular, a lot of coolers come with a UV protected body, which helps in cases when you plan on spending an extended period of time outdoors. All you need to ensure is that the cooler doesn’t get warped because of extreme weather conditions. You are the one who has to manage the cooler when loading it in and out of your vehicle or vessel. That’s why it is essential to consider a cooler that can be carried easily. Especially, if you are a solo fisher, it is very important to opt for a lightweight model that you can carry it by yourself. Other than that, look for the models that have comfortable handles; the ones that you can afford to carry and how convenient it is to carry. Unless a cooler is very lightweight and small, you shouldn’t opt for a cooler that doesn’t come with handles. The best of the best coolers come with a responsible way to remove ice melted water. Pick a cooler that is equipped with drains. The most convenient option is the one that has recessed channels, and the holes are placed at the bottom of the cooler. You don’t need to lift or tilt the cooler just to drain the water at least twice a day. Notably, those coolers that are heavy or difficult to raise. Another thing about the drain holes is that it shouldn’t be too big or too small. While the large ones may seem beneficial, it may release ice cubes in the process. And the ones that are too small will take too long to drain the water. Hence, make sure that it’s suitable. Why Would You Need a Fishing Cooler? Cooling Efficiency: Ice is always the go-to stuff to cook your seafood. When cooling is done in a well-insulated or refrigerated container, your fish is more likely to stay fresh and fine. So, if you are looking forward to a fresh seafood experience, there’s no alternative than cooling the fish in an appropriate cooler. Moisture Retention: As the ice melts, it turns into cold water. This water is very useful in keeping your fish moist by preventing surface dehydration. In tune with that, this moisture retention also helps in keeping the fish healthy by preventing weight loss or a loss in its quality. Convenience: Fishing coolers are not very expensive, neither are they inconvenient for carrying. Most of them are built to be moved, stored and used as needed. Some of them are also made for multipurpose uses, which can save your other food items and drinks conveniently. There are an array of styles, si, es and types that you could choose from. Hence, select the one that fits your needs perfectly and the one that is a convenient option. Unlike other food items, fish starts to spoil immediately. Cooling fishes at a temperature of no less than 32-degree Fahrenheit are extremely necessary to slow down the growth of microorganisms and the spoilage rate. While you can’t stop the fish from spoiling, you can definitely slow it down through the immediate and active cooling system. Another reason why you need to cool your fish is that it will help to prevent the development of rigour mortis in the fish. Rigour mortis occurs when there is an enzymatic reaction at a cellular level that causes the tissue muscles to stiffen. When the fish is kept under colder temperatures, the rigour mortis process slows down, allowing the fish to stay pliable and marketable for long. Q1: How can I make sure that the fishing cooler stays cool for longer? Chill the fishing cooler before you put things into it. Freeze your food and drinks before you place them into the cooler. Instead of ice cubes, use ice blocks. Drain the water when you are on long trips and not when on short ones. Add another extra layer of insulation. Make sure that the latch is closed tightly and correctly. Q2: How long does a fishing cooler stay cool? Answer: It depends on the cooler. Some coolers can stay cold for up to 24 hours while others can stay up to 7 days. Most average-quality coolers remain cold for up to 3 days. Hence, there’s no fixed duration on how long a cooler can stay cold. Q3: How long can I keep fish inside the cooler? Answer: That’s a really important question. The fish will stay fresh and healthy for as long as there is ice inside the cooler and it is cold enough for the fish to sustain. However, it is advisable to process the fish as soon as you can. Q4: Is there any best fishing cooler that I can just buy without reading many reviews? Answer: Actually, there are no terrible coolers. All are excellent in their own way. It depends on what and how you plan on using your cooler. It needs to be able to fit your needs. What are you looking forward to doing with the cooler? Just cool your fish? Or even put your food items and drinks, too? Know that the higher the insulation of the cooler, the better its temperature consistency is going to be. A fishing expedition is totally incomplete without a fishing cooler. That’s because you really wouldn’t want your fish to spoil after a successful catch, would you? With such advancements in technology, fishing coolers have become so much better than they were before. They are able to retain ice for more extended periods and are so much lighter than it used to be. Moreover, there are so many designs and styles to choose from that it has now become a challenge to select the ideal one that fits your needs. 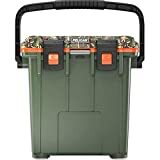 Hence, we have put together this list of best fishing coolers, which we believe will help you minimize your choices and come to a conclusion. We have also listed some of the factors that you need to consider when making your purchase. We hope that everything that we have entailed in the article was helpful for you in some ways. Let us know which is the one that you finally bought; we’d love to know!